Cruises To Turks and Caicos Islands - Top 5 Picks! Cruises To Turks and Caicos Islands – Top 5 Picks! Cruises to Turks and Caicos take you on a breathtaking voyage into the beautiful clear ocean waters and the unspoiled beaches that the Caribbean is famous for. Add the lovely warm ocean breezes and the gorgeous temperatures and you have all the makings of a fantastic vacation. Caribbean cruise deals can be had at most times of the year; here are just a few of the amazing cruises to be had that visit the Turks and Caicos Islands. Carnival, the ‘fun ships’ dock at the Grand Turk cruise port all year round. Take an 8-night voyage right from New York, Florida or Charleston, NC and stop at various ports of call on your roundtrip adventure. Princess Cruises offer a 7-night stay roundtrip from Ft. Lauderdale, Florida. Cruises to Turks and Caicos are just one of the many voyages that can be chosen from when you go with Princess with stops at different Caribbean destinations along the way. Holland America also embarks from Fort Lauderdale and in 7-nights travel to many ports of call for a truly tropical island hop. If you prefer a 10-day excursion, then check out the offerings from Regent Seven Seas. This roundtrip from Miami takes you to the Turks and Caicos, as well as other destinations like Nassau and San Juan, all on smaller, more intimate cruise ships. Silversea has been named the best small ship cruise line and with an exciting itinerary it is easy to see why. They offer a 10-night trip from Florida that stops in the Turks and Caicos, as well as other Eastern Caribbean cruises to suit every cruiser’s tastes. 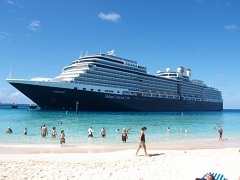 Cruises to Turks and Caicos wouldn’t be complete without Grand Turk excursions. This small island has plenty to do, white sand beaches and beckoning clear ocean. Excursions include kayaking, scuba diving, snorkelling, boat tours, horseback riding on the beach, renting a cabana and relaxing by the pools, taking a 4×4 safari adventure and visiting Gibb’s Cay, among others. The newest excursion is right in the Grand Turk Cruise Port and is the Flow Rider surfing simulator. Even if you’ve never surfed before, this is your chance to get in on the action, and it is conveniently located right as you exit your ship. All excursions on Grand Turk are exclusively booked through your cruise lines, so don’t miss out on the fun, book early so you don’t miss out! Cruises to Turks and Caicos offer something for everyone, whether you want to explore, relax or simply take in the sights.